Even before technology took over, Samsung has already been on the grind in the electronics industry. Samsung first came to the Philippines in the year 1998. Twenty years after, Samsung has now established a solid foothold not only in the electronics industry but also in the Filipino household. I think it’s safe to say that Samsung has already weaved its way through the technological preferences and psyche of Filipinos when it comes to appliances. Two decades later, Samsung has not shown signs of slowing down. The brand continues to thrive alongside its loyal customers, coming up with ingenious solutions to their ever evolving, and always changing demands. Samsung Digital Appliances has been tailored for everyday use. The ingenuity of their products strive to uplift the hassles of daily lifestyle. Their appliances are thoughtfully engineered to be the perfect counterparts in the household, giving users more time for tasks that matter more. And now, more Filipinos can easily acquire these items for their homes through the brand’s FlexiSpecials promo. Give the Samsung Fully Automatic Top Load Washing Machine a spin and witness the care it gives out to your clothes. This machine sports the Activ DualWash System that comes with a built-in sink, rubbing board, and water jet for the convenience of hand-washing delicate fabrics and pre-heating heavily soiled items. It also comes with the Magic Dispenser, which conveniently dissolves and distribute detergent evenly before the wash cycle starts. Too add more, this washing machine comes with Samsung’s Wobble Technology that spins clothes in a very random manner to minimize damages related to tangling. Keep your ingredients fresh with the Samsung Twin Cooling Refrigerator. This piece of technology flexes not one but two evaporators—a pioneer in its time that creates the perfect environment for keeping food fresh just the way you like it. This refrigerator also sports a Smart Conversion Feature. This feature is a total game changer, that at the push of a button, users can choose between five freezer settings depending on the energy and storage requirement the user desires. Beat the heat and get the comfort that you deserve with the Samsung Split Type Inverter Air Conditioner. This wonder is rigged with a digital 8-Pole Inverter Technology that produces less noise and greatly reduces energy consumption by keeping the compressor work at optimum level. Unwind and enjoy family time without the worry of having high electricity bills playing at the back of your head. Also, when you turn the Fast Cooling Mode on, the compressor and fan will run at a maximum level for 30 minutes to quickly lower the room temperature and immediately alleviate the irritation caused by the heat outside. Cook healthy and hearty while adding a generous sprinkle of flavor with the Samsung Microwave Oven with Healthy Steam Function. Definitely for the folk that loves cooking at home, you’ll enjoy the healthy steam feature which keeps the moisture and flavor intact. Also enjoy the plate-warming feature that keeps the warmth of the food until it is ready to be served. 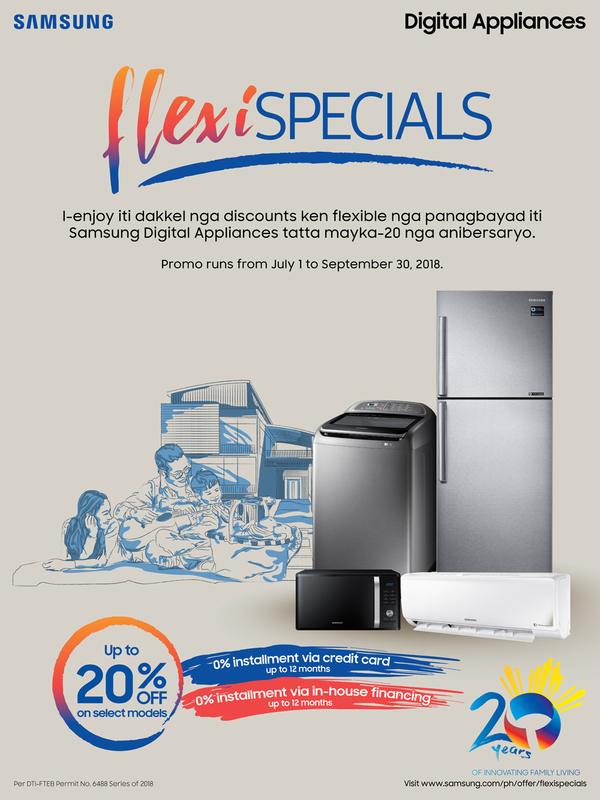 With Samsung’s FlexiSpecials promo, all these appliances and other select releases are now within your reach. They will be available in all participating authorized dealers nationwide until September 30. For more information on how you can get these items, visit samsung.com/ph/offer/flexispecials.